Ideally located in the main street of the historic center of Villeneuve-Les-Avignon, this charming cottage completely restored is ideal for holidays or a weekend in Provence. With its breathtaking view of Fort Saint André, this fully renovated accommodation consists of a sleeping area with a bed 160 cm and a seating area consisting of a large corner sofa and a space office. You will also find a separate toilet and a bathroom with a walk-in shower. On the ground floor, you can enjoy a private courtyard in the shade of its large stone walls to relax or take your breakfast. A fully equipped summer kitchen is also available. Tea and coffee are available in the room! As well as the change of sheets and towels. Catherine has created a wonderful place to stay near Avignon. Villeneuve-les-Avignon is a lovely area with lots of stores, restaurants and historical places. It is a short ride on public transit to Avignon itself. There is free parking located nearby. The flat is beautifully decorated and well equipped. It does have a bit of any unusual arrangement with the kitchen beside an interior courtyard on the ground floor and the bedroom, sitting area and bathroom located up on the second floor. Other than having to climb lots of stairs (good exercise), the arrangement works well as the weather was good and the courtyard was a lovely place to sit and eat. 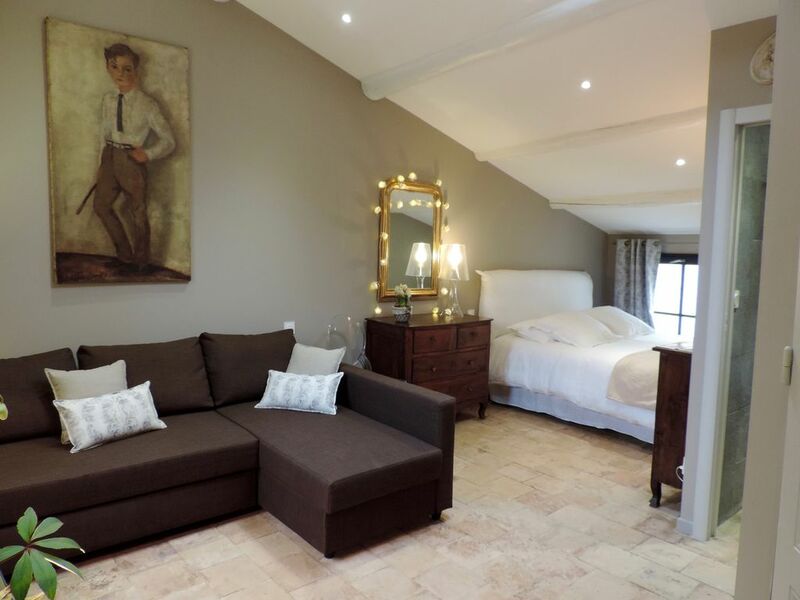 The upstairs room is beautifully decorated and comfortable. Catherine is a friendly and helpful host and I would highly recommend this place to stay. Catherine’s home is perfect. Situated on a quiet street, her home makes you feel like you just stepped into the book “a year in Provence”. Walking in the door, you will find a quiet patio all to yourself that is off of the kitchen. Up the stairs to your room, it feels like a studio it’s so roomy- but the entire home is yours. Above all, Catherine is an French angel in every way. She offered to pick us up at the train station, gave us a full walkthrough of her home and even had fresh preserves waiting on us in the kitchen. We can’t wait to stay here again soon! Beautiful old property with a modern feel. We had a lovely welcome to the property, we're showed around and even offered a walking tour of the village. The property itself is very central, above a fantastic boulangerie, and a few steps away from the most amazing gelateria - what's not to like!! The kitchen had everything we needed for our two night stay, and the bedroom and bathroom were beautifully decorated and very comfortable. We really loved our time there, and was perfect for a couple or single traveller. The village itself is simply lovely - some great places to eat and plenty of parking in and around the village. Highly recommended. Very nice apartment. Close to everything. The location was excellent. You are right next door to an amazing bakery. 2 minutes walk to restaurants and cafes. We even walked to Port d’Avignon which is about 30 minutes. It’s a great location close to Avignon yet away from the noise and the crowd of Avignon. The place is charming with a beautiful court yard. And the host Kathryn is super nice. Catherine remodeled and furnished this place as if it were her own home. Every detail is aesthetically pleasing, and she has thought of everything. Every part of this place is perfect, comfortable, well supplied. She has provided everything a traveler needs, and then some. She was kind enough to pick us up and take us back to the train station, and it's clear that she really is dedicated to having travelers enjoy this lovely place she so thoughtfully arranged. Kathy et son amie sont des hôtes très sympathiques et qui ont su prendre soin de la maison. My husband and I had the most wonderful stay at Catherine's apartment in Avignon! It was beautifully decorated, had everything we needed for our stay and we loved it so much we extended our visit. Bakery, restaurants, grocery, laundry and wine is within a few steps of the apartment and we just enjoyed the kitchen and patio area for our morning and afternoon coffee-wine. Catherine is most gracious and helpful. I highly recommend Catherine's place if Avignon is on your travel plans.